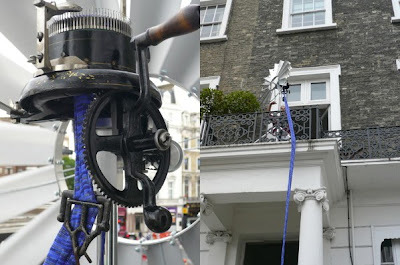 From the High North: Wind powered knitting machine! This is just about as cool as it gets! I saw this machine on http://www.engadget.com and just had to spread the news! The ingenious artist Merel Karhof has a solution for the ones who find knitting difficult and want a scarf. She has designed and invented a machine that knits all on its own, powered by wind. Called the Wind Knitting Factory the machine knits a scarf in about two hours, given a little wif of wind. What a great machine! What's the weather like in Norway today? That's really cool!! Even I could knit a straight scarf then. perfect for no patience people like me! wow, thats amazing...i could do with one of them! I could surely use this! This or a band of roving elves that would come into my studio at night and finish projects for me--and clean up after me!